An inside-needle extraction method was developed through thermal polymerization of atrazine-molecularly imprinted polymer (MIP) on the internal surface of a stainless steel hollow needle, which was oxidized and silylated. The fabricated coating (MIP layer) for the needle was durable and showed very good chemical and thermal stability. It could be mounted on a glass syringe and be directly coupled with gas chromatographic (GC) systems. The parameters being effective on the coating and extraction processes, namely nature of oxidizing agent, silylation time, nature and amount of porogen, template-to-MIP components ratio, polymerization time and temperature, sample volume, flow rate, pH and ionic strength of the sample were investigated and optimized. The extraction needle showed high selectivity as well as a great extraction capacity for triazines. 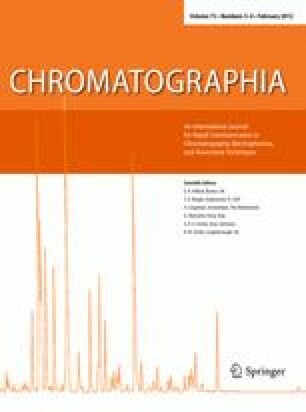 The extraction of atrazine, simazine, cyanazine, ametryn, prometryn and terbutryn using the fabricated extraction needle and followed by GC analysis resulted in detection limits of 2.6, 21, 24, 32, 38 and 42 ng mL−1, respectively. The fabricated needle proved to be applicable to the analysis of real samples by comparing the results obtained for non-spiked and spiked samples of grape juice, tap water and groundwater.